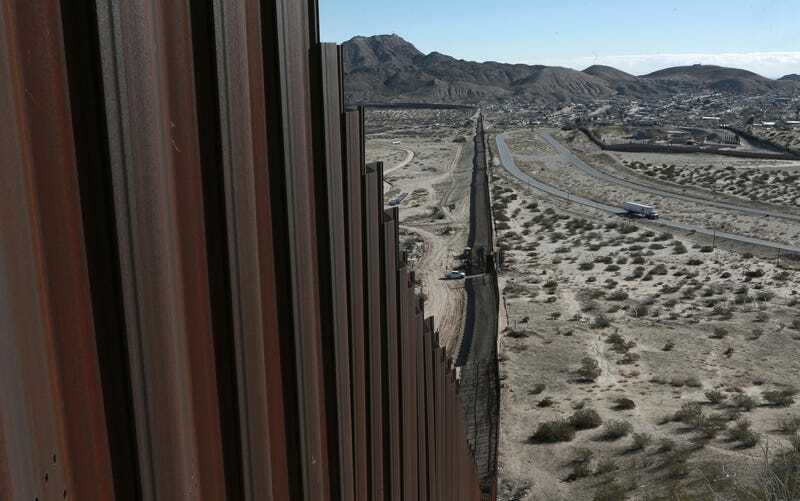 Border Patrol agents got lucky a few days ago when they spotted several people running away from a section of border fence near Douglas, Arizona. After going to investigate, the DHS employees discovered a catapult and two giant blocks of weed. You can guess what the catapult was for. That’s right: it was for slinging weed over the wall from Mexico to the United States. The agents called Mexican authorities and disassembled the catapult which was rather gracefully constructed from square tubes welded together, a heavy spring mechanism, and rope. Mexican authorities confiscated the catapult. US authorities got to keep the 47 pounds of weed. The new catapult design makes much more sense. Based on the image provided by the US Border Protection’s media relations team, it looks like the device just hangs on the top of the wall so it can be unhooked and moved rather quickly. Well, not quickly enough, since the drug smugglers who just lost their weed and their catapult didn’t have time to grab it before the fuzz showed up. But at least they saved their asses from getting thrown in a brutal federal prison where Trump would probably want them waterboarded because this is the world we live in now.